- the oil-based stain needs more time to dry that allows for a more even finish, penetrates wood deeper, requires less for long-term maintenance, is extremely durable and offers a thicker seal for wood. The type of wood also plays a key role in deciding the right stain. For example, when coating a wood with natural resistance to rotting, it is better to use a water-based stain. Examples of this kind of wood are cypress, cedar & redwood. Similarly, previous wood treatment is a crucial factor to arrive upon the correct stain. If the wood to be stained bears a previous coating of stain/ paint, care should be taken to ensure a new, even protective layer. It may be difficult to ascertain the previous layer, but knowing it will undoubtedly help in choosing the apt stain. If the previous layer is oil-based, opting for a water-based stain now is advisable as the latter will adhere better as compared to an oil-based one. The kind of weather the wood will be exposed to is also significant in determining the best stain-base. 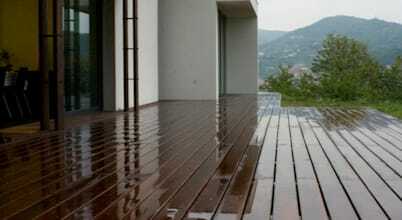 If the wood element is going to have a direct exposure to rain, wind & sunlight, an oil-based stain is the best option. This is because it is more durable than a water-based stain, and will impart a much better protective cover against these weather conditions. Interior spaces like bathrooms & kitchens are also in constant contact with varying levels of high moisture, especially bathrooms. And so, staining the floors & other wooden surfaces becomes important in these spaces too. In this image, the stained pine floor looks natural even in the monochrome design.